We believe in making teams work together in an active and lively atmosphere of learning and reflection. A team building event is the right place to test and try out pre-conceived ideas and concepts of how to work collaboratively as a team. Strengthscape has designed all the team building challenges with the sole objective of improving work relationships in an entertaining, informal way. To achieve success in a project, it is well known that all the members of the team have to actively contribute and work together cohesively. This process highly depends on the team's project manager for it is the responsibility of the team manager to efficiently build his team. Team building is no easy task. Traditional ways of team managing no longer works effectively where exercise of power and authority and being tough does not drive the team to produce the expected results. It has been observed that this kind of leadership style discourages the members of the team, fails to persuade the members of the team do their best and lead to attrition. Team building is an art and the knowledge of psychology is essential as how people behave in groups, what drives the team to perform better, what motivates them to work cohesively, etc. 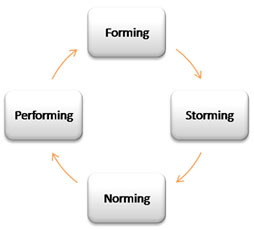 To build a high performance team, understanding the Tuckman's Stages of Group development is essential which will aid in taking necessary action for each stage of team development. The model is shown below. Setting an essential culture for the team is significant for team building. Collaborative team culture is essential for effective team building where each member of the team is viewed as an important individual who can make valuable contributions to the project irrespective of the designation or job role. To be a successful team manager, one has to adopt two different styles or role that has to be implemented appropriately. One as a friendly, collaborative and supportive mentor and other as a tough and demanding figure so that he is not taken advantage of. This is best explained through the illustration of school children who know how to behave with teachers who are friendly, supportive and encouraging. Children are aware that if they behave badly they will damage the teacher-student relationship which will lead to the teacher adopting the role of a strict head teacher. It has been observed that sensible balance between reward Vs punishment, opportunity Vs threat, pleasure Vs pain and encourage Vs coercion is essential for good balance of personalities and skills that will result in building high performance teams.